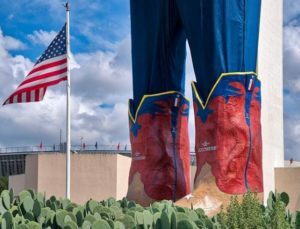 Big Tex got a brand-new pair of custom Lucchese boots for the 2018 State Fair of Texas, and now he just can’t get enough! He wants to sport a fresh, new design next year, too. This year’s boots were designed and constructed by a team of Lucchese bootmakers in El Paso, TX, but now Big Tex wants to give you a chance to design his boots. The 2019 Big Tex Boot Design Contest, presented by Lucchese Bootmaker, gives Fair fans the chance to design the biggest, best-known pair of boots in the Lone Star State.